Considered the South's most beautiful cities, you’ll be entranced by the charm, history and vibe of Charleston, Savannah and New Orleans. Travel through three US states each as diverse and colourful as the next. 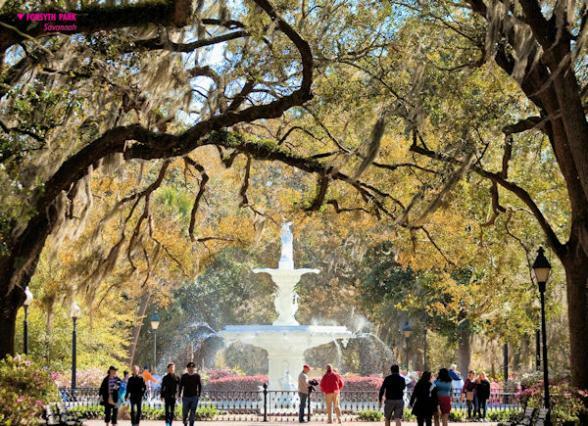 South Carolina, Georgia and Louisiana make an ideal combination and with no driving involved and many must-do excursions included, it means you can sit back and soak up the scenery. 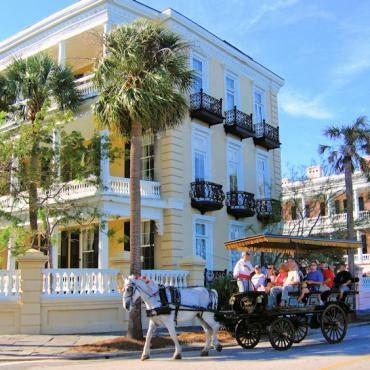 With its beautiful gardens, vibrantly painted Georgian houses and carriages clacking along cobble streets, Charleston has long been considered one of America's most charming cities. But, underneath its sleepy veneer, the city is known for eclectic cuisine, a thriving theatre and cultural scene, bustling King Street and an historic city market. An evening stroll along the Battery is the perfect way to end the day in this genteel city. 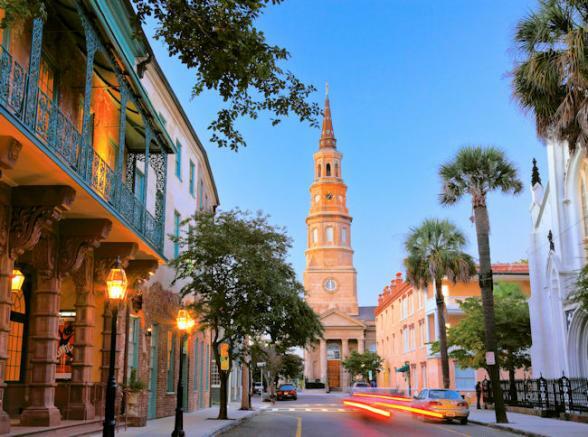 As an introduction to Charleston we've included a gentle walking tour where you'll learn about the city's colonial past and how the first decisive victory of the Revolutionary War was fought in Charleston Harbour. During the golden age of cotton, Charleston became the wealthiest city in the country but the shadow cast by slavery is also an important part of the story. Foodie? You’ll find the included 2.5 hour Charleston Food Tour a bit delicuous! Taste your way around the city as sampling the delicious cuisine of South Carolina’s Lowcountry in local markets, bakeries and culinary landmarks. To learn more about Charleston click here. All aboard today for your early evening two-hour train journey to Savannah on the Palmetto Amtrak service*. You’ll travel in business class for added comfort, early boarding and tea and coffee once on board. 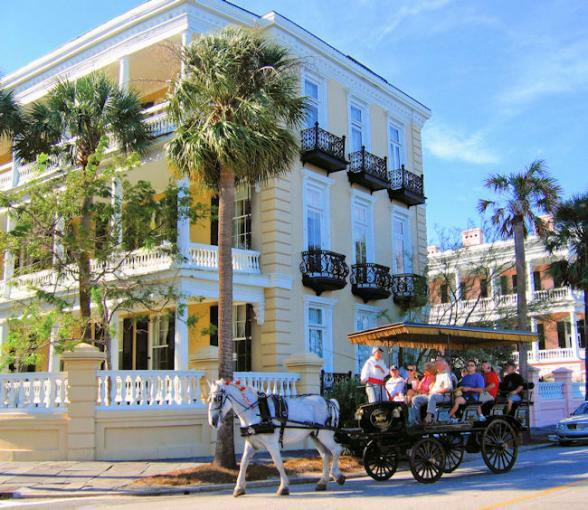 Awash with elegant townhouses, verdant public squares and magnificent antebellum mansions, Savannah is picture-postcard pretty! 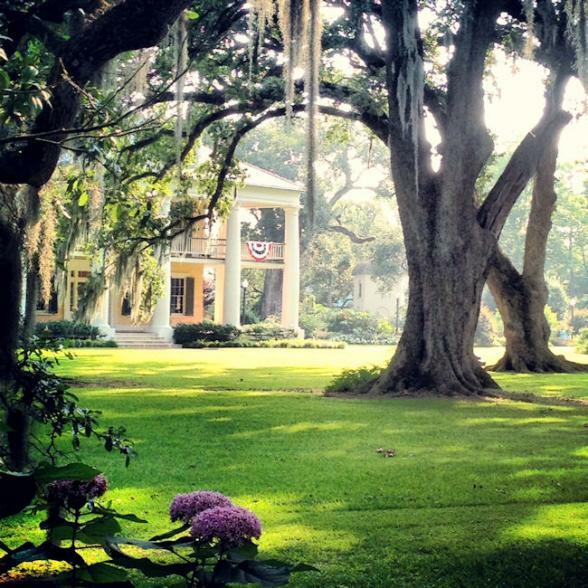 With over 300 years of history, it’s home to one of the largest National Landmark Historic Districts in the U.S. 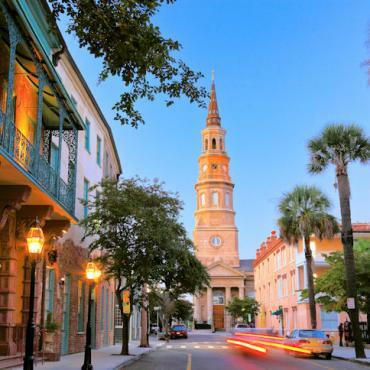 The Historic District’s 22 squares, which formed a vital part of General James Edward Oglethorpe’s original city plan when he founded Savannah in 1733, serve as the heart and soul of downtown Savannah and have been widely praised for their beauty. This historic part of the city is alive with music, art, dance and live theatre. 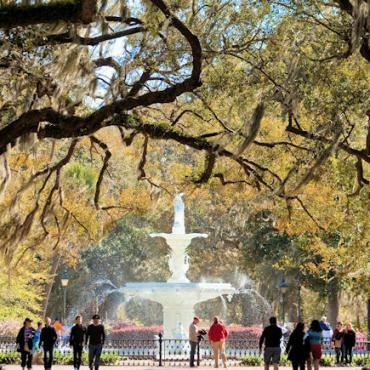 Also enjoy strolls through the 2.5-mile district from River Street to Forsyth Park, pop into the quaint shops or dine in world-class restaurants nestled beneath a canopy of Oak trees. The last of the 13 British colonies before the United States were formed in 1776 – Savannah's history is robust. There are historic buildings and monuments around every turn and tours for all tastes, shedding light on topics like the establishment of the city. We’ve included a tour with one of our favourite guides in the South, Savannah Dan. This fine Southern gentleman will entertain you with whimsical and entertaining facts about the city from its founding right up to present day movies that have been set in the city, including the iconic 'life is like a box of chocolates' bench scene from Forrest Gump. Known as the ‘Hostess City of the South’, this is where people flock to indulge in traditional Southern and soul food, with a modern twist. With Savannah’s proximity to the ocean, seafood features heavily on most menus. Our favourite has to be the Savannah seafood parmesan and the spicy, garlic blue crabs! In the evening, sip cocktails whilst enjoying views over Savannah’s waterfront, hop aboard a riverboat cruise, or learn why Savannah is considered one of the most haunted cities in the USA on a guided ghost tour. *Private transfers by sedan are also available, please enquire for prices. Leave the state of Georgia behind today and take a mid-morning flight to New Orleans, Louisiana. America’s most sensual city is steeped in influences from Europe, the Caribbean, Africa and beyond, it’s a brilliant mosaic of culture, food and music. Here you’ll find the roots of Jazz and a blossoming culture that is like nowhere else on Earth. Founded in 1718, New Orleans is an extremely walk-able city. 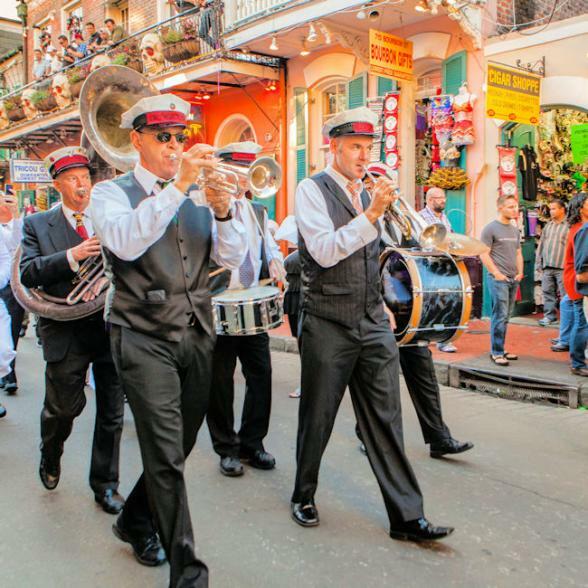 Head for the intriguing French Quarter with its Spanish architecture and check out the lively jazz clubs on Bourbon Street or the artists of Jackson Square, the soul of the French Quarter. Apart from the clubs, bars, restaurants and cafes, the FQ is full of museums from World War II to voodoo. We've included a paddle steamer cruise along the Mississippi River and a morning tour of one of the most magnificent plantation homes on The Great River Road, Oak Alley. There’s plenty to do including swamp tours, horse-drawn carriage rides, jazz cruises, Cajun cookery lessons and Mardi Gras World tours - all of which we’ll be able to book before you travel. Food, glorious food! You’ll find your time in New Orleans isn’t kept in hours or days, but in meals. Beignets for breakfast, shrimp po-boys and muffulettas for lunch and gumbo, shrimp remoulade and grilled oysters for dinner. One this is for sure, dining is a passionate art form in New Orleans. It’s no wonder it’s often named as “One of America’s Top 5 Restaurant Cities”. Bon Voyage would be pleased to suggest and pre-book dinner reservations for you. Your late afternoon flight back to the UK leaves just enough time for breakfast beignets, souvenir shopping and a stroll along the Mississippi River. Want to extend your holiday? Perhaps, time in Memphis or Nashville or a stopover in New York, Boston or Washington on your way home? A Gulf of Mexico or Mississippi River cruise? All Bon Voyage holidays are tailor-made, please discuss your ideal trip with our team of experts.